#2765 provides Fibre Channel attachment capability for external tape devices. The #2765 supports point-to-point and arbitrated loop topologies. Each #2765 is shipped with a wrap connector (PN#05N6767). #0371 - LC-SC Adapter Kit (50um) can be ordered, both on initial and field upgrades. This optional kit is used to attach SC-type fibre (50 micron) cables to a #2765. This kit contains a 2m LC-ST cable and ST-SC adapter for 50 micron fiber. 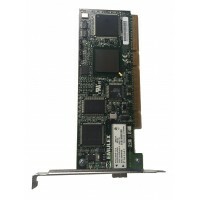 #0372 - LC-SC Adapter Kit (62.5um) can be ordered, both on initial and field upgrades. This optional kit is used to attach SC-type fibre (62.5 micron) cables to a #2765. This kit contains a 2m LC-ST cable and ST-SC adapter for 62.5 micron fiber. An optics cleaning kit and instruction sheet instruction are included when a #2765/#2766 is ordered. Customers must supply all Fibre Channel cables for this controller. Only one Fibre Channel tape device can attach to a #2765. OS/400 V5R1, or later, is required. #2768 provides Ultra SCSI attachment capability for an external tape and/or an external CD-ROM device which have a Single Ended SCSI interface. See the Devices Supported section for a list of devices supported by the #2768.